It’s funny, I’ve often thought “Oh wow, I wish I would have done more spontaneous things, gone to more events, taken more little trips before we had 80.” I didn’t really want to blog about it, because it’s pretty whiny, and I don’t want to give the impression that life is limited now. It’s more like I didn’t realize how much free time I had until now. Now that I’ve spent four days in bed (thanks to my back), I realized I’m starting to thing “Oh wow, I can’t wait until I can walk, and I’m going to go on walks with 80, go down to Harvard Square to look at people, play in the snow, and go visit friends.” Part of the reason why I’m lying here in bed is because I’d not being leaving the house much and not getting exercise. A million feet of snow will do that to you. So now, I’m reminded that much like before I had 80 I should have done so many things that are harder to do with a baby, now that I have her I should go and do all of the things that are great to do with a baby, that maybe seem a little hard (restock the diaper bag, put tiny snowpants on) but that I’d kill to do today instead of lying here in bed. Today’s lesson is: Pollyanna yourself! Also, don’t forget to exercise (especially walking) if you’re a new mom. Those ligaments are extra stretchy still and not being able to take care of your child is reason enough to get moving. Jason and I have sworn that we’re not going to be parents who end up staying home for the next five years. We’d like to start our kid on dinners out and traveling as soon as we can. 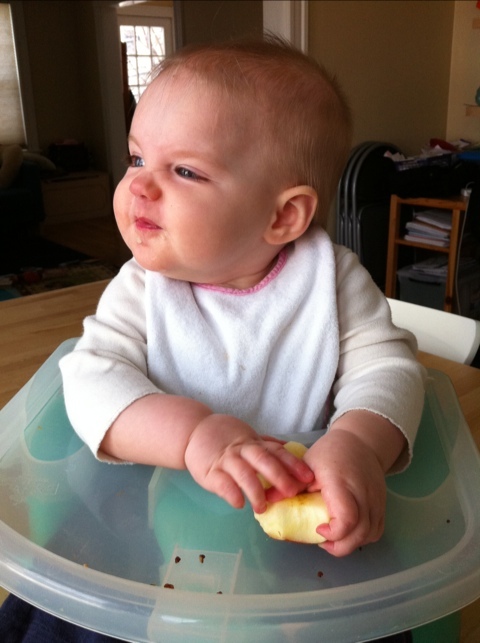 Our motivation is to be able to continue to travel, but also to have a child who is comfortable in many situations. Since all of our family lives out of town, this will ensure good family contact as well. I’ve been to India twice, once as an undergraduate on a set tour, the other time for six months with my husband and daughter (when that Taj Mahal photo was taken). Perhaps the most interesting thing about the longer trip was traveling with a child. It’s a thing few people do (with reason — it’s hard work!) and as a result, the people who live there get a somewhat skewed idea of who and what Americans are. To see a Western family walking up the village street — mother, father and small blonde child — acts like an instant outstretched hand. This may be an idea for diplomatic overtures to parts of the world with ambivalent feelings about the United States: offer free plane tickets to any family willing to take small children with them, and watch the amity grow. Now I can add “bringing about world peace” to the list of benefits. 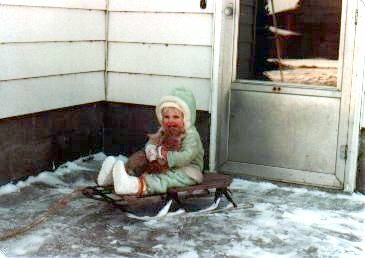 Yes, that’s a photo of me, on a sled, with kittens. I figured you could use it to get through your day.